If i recall correctly their What is this? explanation wasn’t the same back then .. or i was just so terrified of Magento at start that i didn’t understand anything at that point 😉 I knew i need to paste that key somewhere, in something they called my Magento connect manager or Magento downloader, but i didn’t understand where it is. Visit Magento connect page. There are really some great extensions there and many of them are free. Find extension that interest you, click “Get extension key”, agree with license agreement and get key. Pay attention to Stability description field (stable, alpha, beta). http://www.yourmagentoshop.ext/downloader in your favorite browser. you should change this option to appropriate one. You should of course be careful with alphas and betas and know what you’re doing. If you are developer or just interested, ftp to downloader/pearlib/download after you install extension and you’ll find packed downloaded extensions there. Hi any one have idea about the error. “please re-enter your Magento Adminstration Credentials. So what changes need to be done to install the theme. Thanks in advance. OK so I’ve got an extension. Downloaded the files directly from the website developer. I uploaded the files via ftp. Extension works great and I’m happy. However, this extension doesn’t show up in connect manager. I’d like it to show up in the manager so if there are any updates I’ll easily know. Is there a way to upload something to the connect manager so that my site knows that extension is installed. (I actually often download through freegento so many of these extensions are have magentoconnect urls. I have install extensions but can’t find any block for it. Could not resolve host: magento-community; No data record of requested type. Pl. help me to solve this problem. Thanks. I am not able to install extension from magento connect. When I insert key say install after some time I got error ‘Invalid channel.xml file’ for any extension. Please help me. Thanks in advance. Why i can’t log into the magento connect manager?? *after i enter my admin name and password,it appeared:——Invalid user name or password,Please re-enter your Magento Adminstration Credentials. *i promise the name and password is right. Is anyone know about this? What should i do?i have absolutely no idea. 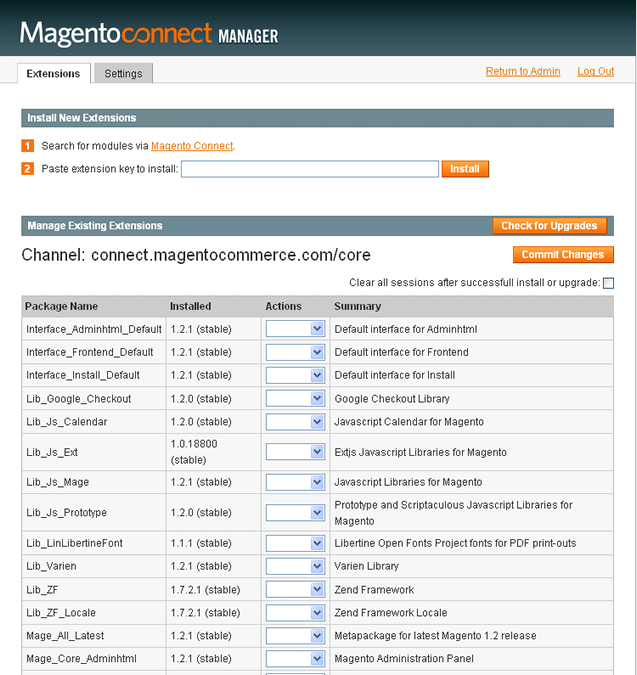 is it possible to install a 1.4 widget in magento connect manager 1.5 ? You can install by two methods to install extension in localhost or live for magento 1.5. 2nd. Download the extension package and place in each folder the corresponding files in your localhost magento folder. It can be quite confusing at times to know exactly what you need to do when installing magento extensions or even when you are just trying to figure it out for the first time. Magento Development can be quite sticky if your not sure what to do. I would suggest getting a magento developer to help you out. Hi, I am new for magento. I am unable to install the extension on version magento 1.5. The error is Could not resolve host: magento-community; No data record of requested type.. Can you plz help. “Are you sure you want to navigate away from this page? There are PEAR processes running. If you will close the window or navigate away from the page, installation will be interrupted. It doesn’t matter if I click cancel still won’t do anything. Any help is appreciated, thanks! @Toni Anicic :: Thanks for your reply. Is there any other option so that i could install extensions in 1.5 , as just now i tried , i am able to install extension in 1.4 but not on 1.5. MagentoConnect was briefly down, try again. Hi, I am web developer from nepal. I am unable to install the extension on version magento 1.5. The error is magento-community host not found. Can you plz help. I am trying to update 1.3.2.4 to 1.4.1.1, in magento connect manager it listed all the latest but not giving option to update it. what could be the problem ? Anyone have a clue how to just download the code and not install the extension? This really depends on your server configuration, however it’s always good to restore permissions to defaults if they are changed to 777, just to be sure. Thanks for the info, this is exactly what I needed. After you use the downloader do you need to change the folder permissions back for security reasons or is it OK just to leave them at 777?